MLS referees don’t have the greatest reputation. Granted, few referees do, but in MLS they seem to have more trouble than in a lot of other leagues. Maybe this was part of the reason why MLS was so eager to become an early adopter of video review, but now even that is adding to the refs’ shame. In stoppage time of Orlando’s 3-1 loss to the New York Red Bulls, Kaka playfully grabbed the face of friend and former teammates Aurelien Collin after a squabble involving several other players on the pitch. Both men laughed as it happened, making it clear there was no foul intent, but a nearby linesman didn’t find it so funny and informed the referee, who then reviewed the video of the incident. He then showed Kaka a red card, indicating that it was for putting his hands on his opponent’s face, which, given the assumption that this would only happen with nefarious intent, is a red-card offense. Kaka and his teammates argued the decision in total disbelief and called Collin over to do the same. When he explained to the ref, the unimpressed official put up his hands and walked away. Which is pretty remarkable—especially in an age when the Brazilian and Italian federations have introduced the concept of issuing a “green card” as a reward to players who inform officials of a mistaken call that harms an opponent. 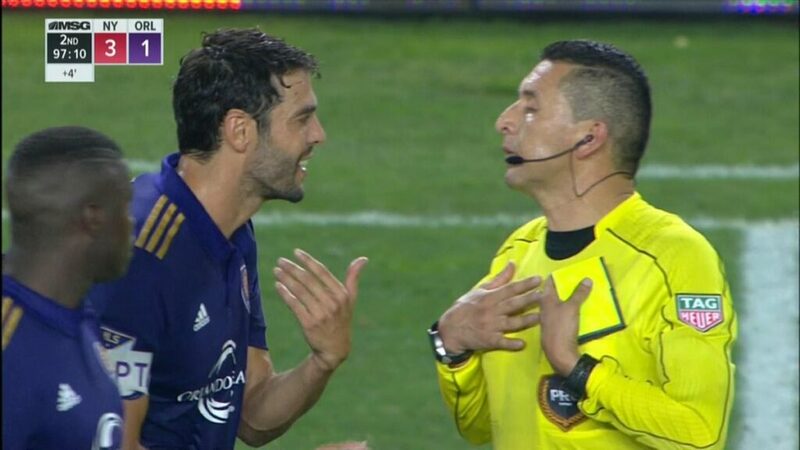 But in MLS, Kaka—KAKA, of all people—gets sent off. Two days after the match, Orlando City issued a statement defending their captain, but, shockingly, accepting the decision and resulting one-match ban for Kaka. In the closing minutes of Saturday’s match between Orlando City and the New York Red Bulls at Red Bull Arena, Orlando City captain Kaká was issued a straight red card following a playful interaction with former teammate Aurélien Collin. Immediately following the Video Review of the incident, several Orlando City players and Collin approached the referee to explain the friendly nature of the situation. After much deliberation, which included conversations about the global attention this incident is receiving from fans and media alike, the Club will respect the decision made by the Video Assistant Referee, the Professional Referee Organization and Major League Soccer to avoid further unjustified consequences that may come from appealing the decision made on the field. 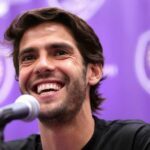 Though Orlando City SC fully supports MLS, PRO and the new Video Review system, the Club does not support the notion that Kaká — a role model known around the world for his upstanding character and demeanor— is guilty of violent conduct, defined as an attempt to use excessive force or brutality against an opponent when not challenging for the ball. Moreover, we also do not believe he deliberately “struck” an opponent or any other person on the head or face with his hand or arm during the match. Kaká has only received two straight red cards in his illustrious club career, both of them in MLS. The Captain will accept the one-game suspension and help our Club and fans focus on the next task – the first home game in nearly a month for the Lions against a strong Eastern Conference opponent, Columbus Crew SC, at Orlando City Stadium this Saturday. So if Orlando appealed the red card that followed a video review, and MLS deemed it “frivolous” (which is a strong possibility given how it would be viewed as undermining both the referees and the new video implementation if they overturned the decision), the club would lose $25,000, they wouldn’t get to appeal any other decision either this season OR next season and Kaka would get a two-match ban instead of just one. Given these repercussions, MLS makes it clear that they don’t want anyone challenging the video review system. Nevermind the fact that it’s brand new and still apparently leaves room for human error. Now video review gets an unnecessary mark against it, MLS referees are made to look even worse than they already did, and one of the league’s superstars—not to mention one of the most honorable humans in the game—has to miss a match. Dumb.